We were lucky to catch NewBrook during Diversity Week in January. Chef Chris went with a Greek-themed lunch, including Gyros, orzo pasta salad, and fruit. Oh, and a fully stocked salad bar, of course! This time around, I was lucky to have my partner in crime—Sheila! Sheila Humphreys is my farm to school partner at Food Connects and we decided to treat ourselves to a Friday afternoon out on the town—aka NewBrook Elementary’s cafeteria. We arrived at noon to a cafeteria full of second graders. Lunch was being served by Chef Chris and his assistant for the day, Principal Scotty Tabachnick. We each got a gyro with meatballs, tzatziki sauce, and crisp red onion, pasta salad, green salad, and fresh fruit. Oh, and my fave—cottage cheese. We were lucky enough to snag a seat with some second-grade boys, James & Nolan. Nolan was having bagged lunch from home, while James munched on a gyro. We chatted about their favorite school lunch items. Nolan loves shepherds’ pie and hot dogs. They also let us know that Chef Chris makes some darn good waffles in the morning. James eats breakfast at school every day. NewBrook puts on a “community lunch” each month, typically featuring produce and meats from local farms. The school accepts donations in any amount and encourages families and community members to join students for lunch. Check it out sometime soon! Don’t want to go alone? Give us a call—we are always happy to dig into a good school lunch! Next up? 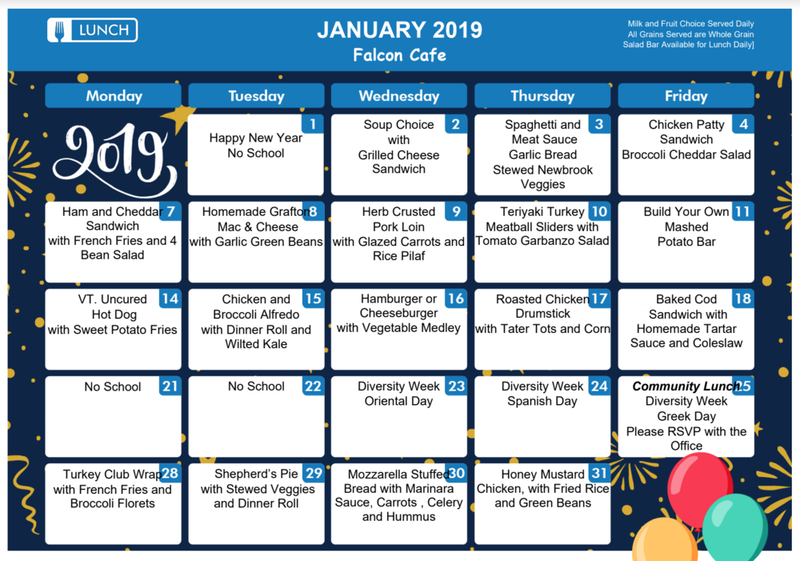 Dummerston on February 8th for pizza day—I might even treat myself to a carton of milk! My first lunch date was with Mandy Walsh, Westminster Center School’s librarian and garden extraordinaire. Because I’m a grown-up, she even let me eat lunch in the library with her—ssh, don’t tell! We chatted about her garden plans over VT beef tacos and mixed greens salad. I loaded my taco up with sour cream and salsa. In true kiddo fashion, I kept my black beans in a separate compartment on my tray—didn’t want them mingling with my cottage cheese! Westminster’s salad bar was loaded up with tender greens and a variety of veggies and dressings. I went with a big helping of greens, olives, and a dash of ranch dressing and treated myself to a small helping of cottage cheese as well. Last, but certainly not least, I grabbed a crisp, local apple from Green Mountain Farm. Voila! No lack of color on that tray! The cafeteria, deemed the Farm to School Café, is adorned with a colorful mural and plenty of student art. Inside, you will find Melissa Bacon and Sarah Allaire. Melissa is a local parent and began her culinary career when her kids entered school. She is an outdoor enthusiast and she has the coolest last name EVER. Sarah also began cooking when her son entered kindergarten. She is an avid gardener, making her the perfect fit for a school like Westminster. Melissa and Sarah source local beef from Big Picture Farm and local apples from Green Mountain Orchards. Oftentimes, local greens come from Harlow Farm just down the road! Though I didn’t get to hang out in the cafeteria, Mandy and I did have a grand ol’ time talking shop about farm to school in the library. On my way out, I ran into a few old friends from my last lunch date at Westminster. Until next time Westminster—thanks for the treats! One gal’s journey into the world of school lunch. When my Food Connects team posed the question, “what’s one big goal you have for 2019?” I paused. What would I set out to achieve in this new year? Overhaul school meal regulatory systems? Build more school gardens? Combat food insecurity by campaigning for school meal participation? Well, yes, I wanted to do ALL of those things, but another idea came bubbling to the surface. I would eat school lunch at all of the 25+ schools that we support in Southern Vermont. I spend my days thinking about, talking about, and (sometimes) dreaming about school lunch! But I realized I haven’t actually enjoyed a school lunch for quite some time—since high school, in fact! Back in those days, I ate school lunch every day. My favorites included the “pizza boat,” canned peaches and, of course, strawberry milk. Well, things have changed a bit since then. School cafeterias in and around Brattleboro and Bellows Falls offer all sorts of delicious treats these days. Think corn chowder with homemade ciabatta rolls or roasted root vegetable pot pie or Grafton cheddar mac & cheese. Can you say YUMMO?! My mouth is already watering. And so my adventure begins. As I’m sure many of you have been dying to know how school lunch has evolved over the past 10 or so years, I will do my best to document this journey. Stay tuned for anecdotes, photos and plenty of vegetable-related puns.